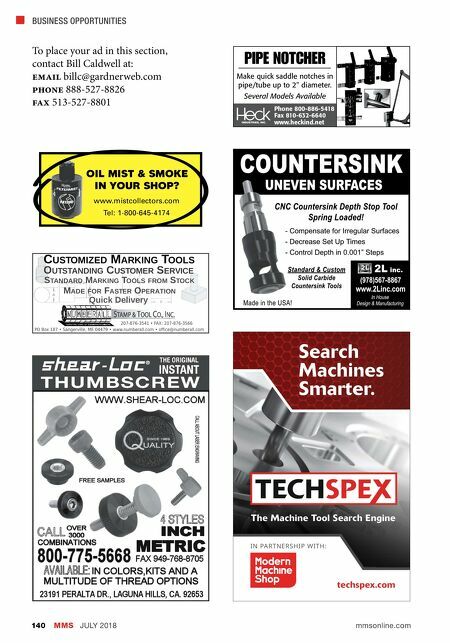 AD INDEX Modern Machine Shop 141 Modern Machine Shop (ISSN 0026-8003) is published monthly and copyright © 2018 All rights reserved by Gardner Business Media Inc. 6915 Valley Ave., Cincinnati, OH 45244-3029. Telephone: (513) 527- 8800. Printed in U.S.A. Periodicals postage paid at Cincinnati, OH and additional mailing offices. Postmaster: Send address changes to Modern Machine Shop Maga- zine, 6915 Valley Ave., Cincinnati, OH 45244-3029. If undeliverable, send Form 3579. Canada Post: Canada Returns to be sent to IMEX Global Solutions, P.O. Box 25542, London, ON N6C 6B2. Publications Mail Agreement #40612608. 2L inc. . . . . . . . . . . . . . . . . . . . . . . 140 5th A xis Workholding . . . . . . . . . . . . . . . 77 A Absolute Machine Tools, Inc. . . . . . . . . . . . . 3 Additive Manufacturing Conference . . . . . polybag* Allied Machine & Engineering Corp. . . . . . . . . 123 Alpha Workholding Solutions, LLC . . . . . . . . 98 American Composites Manufacturers Association (ACMA) . 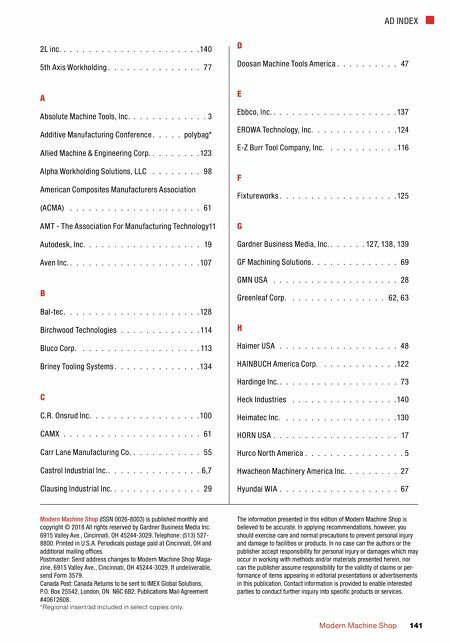 . . . . . . . . . . . . . . . . . . . . 61 AMT - The Association For Manufacturing Technology 11 Autodesk, Inc. . . . . . . . . . . . . . . . . . . 19 Aven Inc. . . . . . . . . . . . . . . . . . . . . . 107 B Bal-tec . . . . . . . . . . . . . . . . . . . . . . 128 Birchwood Technologies . . . . . . . . . . . . . 114 Bluco Corp. . . . . . . . . . . . . . . . . . . . 113 Briney Tooling Systems . . . . . . . . . . . . . . 134 C C.R. Onsrud Inc. . . . . . . . . . . . . . . . . . 100 CAMX . . . . . . . . . . . . . . . . . . . . . . 61 Carr Lane Manufacturing Co. . . . . . . . . . . . 55 Castrol Industrial Inc. . . . . . . . . . . . . . . . 6,7 Clausing Industrial Inc. . . . . . . . . . . . . . . 29 D Doosan Machine Tools America . . . . . . . . . . 47 E Ebbco, Inc. . . . . . . . . . . . . . . . . . . . . 137 EROWA Technology, Inc. . . . . . . . . . . . . . 124 E-Z Burr Tool Company, Inc. . . . . . . . . . . . 116 F Fixtureworks . . . . . . . . . . . . . . . . . . . 125 G Gardner Business Media, Inc. . . . . . . 127, 138, 139 GF Machining Solutions . . . . . . . . . . . . . . 69 GMN USA . . . . . . . . . . . . . . . . . . . . 28 Greenleaf Corp. . . . . . . . . . . . . . . . 62, 63 H Haimer USA . . . . . . . . . . . . . . . . . . . 48 HAINBUCH America Corp. . . . . . . . . . . . . 122 Hardinge Inc. . . . . . . . . . . . . . . . . . . . 73 Heck Industries . . . . . . . . . . . . . . . . . 140 Heimatec Inc. . . . . . . . . . . . . . . . . . . 130 HORN USA . . . . . . . . . . . . . . . . . . . . 17 Hurco North America . . . . . . . . . . . . . . . . 5 Hwacheon Machinery America Inc. . . . . . . . . 27 Hyundai WIA . . . . . . . . . . . . . . . . . . . 67 The information presented in this edition of Modern Machine Shop is believed to be accurate. In applying recommendations, however, you should exercise care and normal precautions to prevent personal injury and damage to facilities or products. In no case can the authors or the publisher accept responsibility for personal injury or damages which may occur in working with methods and/or materials presented herein, nor can the publisher assume responsibility for the validity of claims or per- formance of items appearing in editorial presentations or advertisements in this publication. Contact information is provided to enable interested parties to conduct further inquiry into specific products or services. *Regional insert/ad included in select copies only.